Global 24 Hours of Action for Tasmania’s Forests! Join us on Tuesday 14th or Wednesday 15th February 2012 to stand up for our forests across the world, support Miranda Gibson’s inspiring ObserverTree action and get logging out of our native forests forever. Sometimes the actions of one person can inspire thousands of others. Australia’s world-class forests are still being ripped apart by industrial logging operations every single day. The destruction of our native forests is placing our threatened species, clean air and water, and climate in serious danger. As you read this, Tasmanian forest activist Miranda Gibson has been living on a platform in the ObserverTree 60m high in the tall trees of Tasmania’s western wilderness for nearly 5 weeks. Miranda has vowed to remain where she is until Tasmania’s forests receive formal protection. Malaysian timber giant Ta Ann has played a key role in ensuring that Tasmania’s forests are not protected. Despite labelling some of its products as ‘eco ply’, Ta Ann continues to receive timber from old growth forests in Tasmania, rejecting timber from plantations. The timber is exported and sold in Japan, China and Europe. To read more about Ta Ann and its forest-destroying activities, check out this great report by the Huon Valley Environment Centre. The campaign had a major success last month with one of Ta Ann’s customers UK company International Plywood cancelling its wood contract after hearing about Tasmanian forest destruction. Now it’s time to call on Ta Ann’s major international customers, based in Japan, to follow suit and stop buying wood from our precious native forests. The recent success shows that change is possible. These companies hold the key to forest protection in Tasmania. We need your help to send a clear message to Ta Ann and its customers that Australia and the global community will not accept native forest destruction! International support has played a key role in our campaign so far. When Tasmanian forest destruction is being exported all over the world, it’s really important to have a worldwide response. This is a growing campaign and actions have happened from coast to coast in Australia. We need your help to send a clear message to Ta Ann and its customers that the global community will not accept native forest destruction! All you need to do is gather a few friends, paint a banner that says ‘Tasmania’s forests still falling’, photograph yourselves with it and email us the photo. We also have posters and fliers we can send you with a bit more information about the campaign and things people can do to help. Get hold of a good projector and project some of Miranda’s footage of the forest (which we can send you) onto a wall in a prominent location – the bigger the image the better! If logging has started we will send you footage of logging, if not we will have other images of the forest and the species that live in it. We are really excited about this aspect of the action as we think it will communicate the forest destruction to passers-by in a very powerful way. We’re really keen to raise as much awareness as possible about this huge action, so if you could help us with spreading the word, that would be ace! Please contact us right away on observertree2011@gmail.com if you would like to take part in the action, put posters up in your area, or help us with promotion, and we will send you more action details via our super sonic electro carrier pigeon. * Because of differences in time zones, the action will be held over 14 & 15 February (Weds 15th Feb in Australia). Contact us at observertree2011@gmail.com for more info. Posted on January 25, 2012, in Events. Bookmark the permalink. 6 Comments. 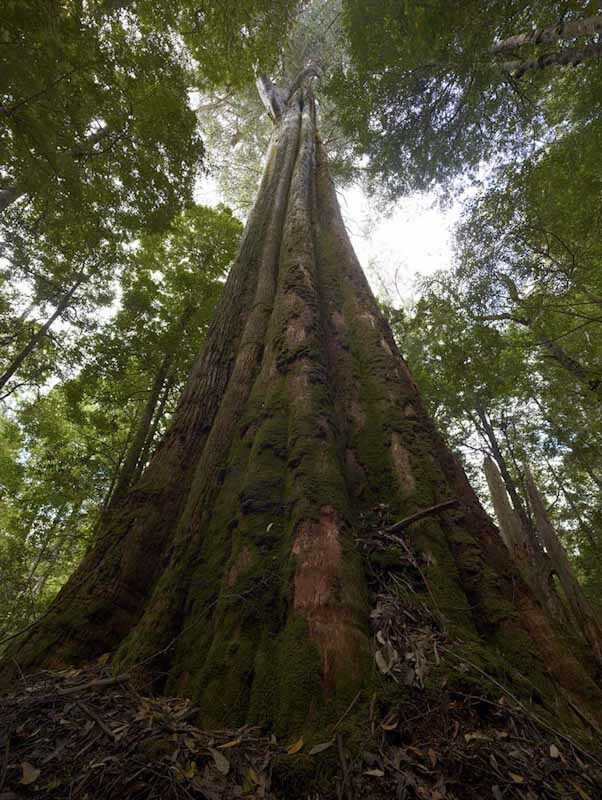 From the Blue Mountains World Heritage you have our old growth forest solidarity ~ from the team at The Habitat Advocate.